Once upon a time before I was an author, I was a therapist. Through answered prayers and open doors, God gave me the chance to earn a graduate degree in Marriage and Family Therapy. I was about a third of the way through my licensing hours when God led me to the next adventure in my life: becoming a mom. Soon after my son was born, I decided to stay home full-time, with the idea that I’d go back to counseling in the future. Well, a dozen years later, I still haven’t gone back, but I find myself returning to my counseling roots again as an author. How? Because I get to counsel my characters every day. I’m currently working on book 3 in my Spark Brothers series and have just finished writing a fairly emotional scene in which everything is coming to a head. My main characters are not happy with each other at all, and it’s a pretty bleak situation. Quite honestly, I feel bad for putting them in this place, but I know it has to be done. Both of them have some personal issues to work through—her, in regards to the past (grieving her sister’s death), and him, with the future (where to go career-wise). And here I am acting as a middle-woman who has the job of counseling them so they’re both emotionally and spiritually ready for a relationship. And boy, is it a lot of work! ;) But it’s so worth it to help my characters get unstuck so they can reach their happily-ever-after. It’s funny how everything has come full circle in my life. God is using something I thought I’d stuck on the back burner to help make the stories I write more developed, realistic, and hopeful. I’m about 75% done with The Sweetest Spark, and I must say that this is one of my most emotional and romantic stories I’ve written. If you’d like to receive an ARC copy of the book, please consider subscribing to my newsletter. I’ll be putting a call out for ARC readers sometime next month. Just click HERE to join. Giveaway: I’d like to give away a $5 Amazon gift card in celebration of Thanksgiving week. Tell me, what are you most thankful for this year? One winner will be randomly chosen from the comments below. The giveaway will remain open until midnight on Sunday, November 25th. Hi Liwen, having the counselling background is certainly advantageous as an author. Funny where God leads hey?! Sounds like your heart is full. :) Thanks for reading and commenting! Hi Liwen. Thanks for sharing your background and how God is this is your writing. God often works in mysterious ways. With so much heartache and tragedy in our world, I am so thankful for a loving husband, three hardworking sons (two who also are good husbands and fathers), two hardworking daughter-in-laws and loving moms, two fine young grandsons growing up to be fine young men (ages 13 & 11), and two adorable close to Oma’s heart granddaughters ages 5 and 22 months. So very thankful for God’s protective hand this fall. Mid October a tree fell gently on our neighbor’s house during a storm and left no damage. Early Halloween morning our house and TV antenna were struck by lightening, while we lost a lot of electronics our house is OK. God is good. Having lost everything in a house fire in 1997, my heart is saddened by the loss of life in California. As retirees so very thankful this Thanksgiving and daily for a good roof over our head, food on our table, health that lets us enjoy life, and the means to have some fun and spoil those around us. Blessing and Happy Thanksgiving. Hi Renate! Wow, I’m so glad to hear you are all okay after the lightening strike! God is so good. I love your attitude of gratitude. Thanks for reading and commenting! Your background is quite interesting. Thanks for sharing. I’m sure understanding something about counseling helps in your writing, and we can notice it in your books. I have a lot of things to be grateful for this year, my family that is always there for me and also I got a new job this year. Hi Laura! Yay for a new job. :) Congrats! Thanks for reading and commenting! How fun that you get to use that in your writing. God is nice to us! I’m thankful for my home, the comforts in it, the lovely neighbors around it. The animals in my pasture and the wildlife all over our valley. It’s a blessing to love where you live. Hi Dalyn! Yes, amen to that! God is amazing in how He works. That is a blessing indeed. Your home sounds like a beautiful place. Thanks for reading and commenting! Interesting post…..love your story. I am thankful for God, family, health. Thanks for your giveaway. Am an avid reader, and Amazon offers great books…lol. I am headed to your website to JOIN! Happy Thanksgiving! Hi Jackie! Haha, I know what you use Amazon gift cards for. ;) Thanks for joining my newsletter! And thanks for reading and commenting. I’m most thankful for my Faith, family, and friends. Happy and blessed Thanksgiving. Hi Lucy! The best 3 F’s out there! Thanks for reading and commenting. I’m thankful that our whole family is going to be together for the first time in ten years. Four kids, six grandkids and us. Hi Paula! Oh wow, that is a huge blessing!! I’m so happy for you and hope it’s a wonderful, memorable visit. Thanks for reading and commenting! The Sweetest Spark sounds amazing. I have training in clinical psychology (before I got my PhD in cognitive psychology) and for a (very brief) moment in life considered going through this route. It wasn’t for me though but I do like reading about therapists (and books from therapists) now and then. I’m also thankful God showed me a different professional path that I love (even though academic jobs are scarce right now). Hi Priscila! You are amazing for getting a PhD! That takes a lot of guts and brain power. :) Sounds like you may want to pursue teaching or research? We certainly need smart, caring people in the academic field. Thanks for reading and commenting! Well that makes me laugh, but thank you. It takes a lot of guts to write fiction too, I’m sure I couldn’t (not good books anyway). I’m trying to get a teaching/ research position, but those are hard, so I’m a postdoc now. Praying God opens up the best door for you! Thanks for your great post today, I love that you counsel your characters, that makes them even more real to me! I am grateful this year for many things, my health, my hubs health, being able to remain in our home after much financial difficulties, and waking up every morning asking how can I be of service tour God this day! Hi Paula! Oh yes, it’s amazing how real these fictional characters can become! My health! It has been a rough year. Hi Kelley! I’m so sorry to hear that. Hugs and prayers for you! Hi Margaret! So true, there are so many blessings—too many to count. So nice you got to celebrate Thanksgiving with your niece and her family. Does this mean you get to celebrate twice? Lol. Thanks for reading and commenting! Truly, one of the holidays that I find most interesting in its concept it’s Thanksgiving. Since we don’t get to celebrate it in my country, I’m grateful for the opportunity to stop for a few minutes and be thankful in random moments, such as an internet post ;) Thus, I’m thankful for my family, for their continued support throughout my career (finishing my senior year this Dec.), and for God’s provision for all of us. Of course, I’m also thankful for authors like you and all the hard work you put into each of your books! Thanks for the chance and Happy Thanksgiving! Hi Priscila! I don’t know if I ever asked which country you live in? And yay for finishing up your senior year! What an achievement. :) Thanks for reading and commenting! Peru! Wow, I gotta Google that. :) I’ve never traveled to South America. So amazing to be able to connect from so far away! So I’m curious, Liwen, which is harder to counsel real people or characters? I’m guessing real people. With characters, they may resist, but you can make them do what you want. Hi Shannon! Most definitely real people. The main reason why I would hesitate to go back to counseling is because it’s very emotionally draining. It’s hard (at least for me) to not carry the client’s burdens home. 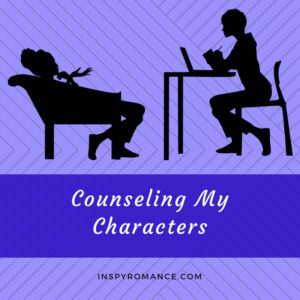 Counseling characters is a lot simpler and faster! Thanks for reading and commenting. I am most thankful for my salvation. Right now I am thankful for competent medical professionals. What started as a normal follow-up appointment for my husband last week turned into an ambulance ride and a few days in the hospital. I am thankful he is doing better and for everyone who helped take care of him. Oh my goodness, Melissa, I’m so sorry to hear that. :( Praying for your husband and you! Liwen, I am most thankful for safety! Living in the middle of California with fires raging around, I would never take it for granted. Praying for all those affected. Wishing you all a blessed thanksgiving! Hi Natalya! That’s right, I seem to remember we live close (relatively speaking) to each other. Yes, thank God for safety! I hope you’ve been staying well with the poor air quality we’ve been having. Take care of yourself and your family! Thanks for reading and commenting. Thank you Liwen! Yes, our schools were closed last week due to hazardous air quality… It’s raining today! Praise the Lord! Thankful for my family and our health. Hi MJSH! Two very important things! Thanks for reading and commenting. This year I’m most thankful for spending Thanksgiving with my parents. As they get older I appreciate my time with them more and more. Hi Melynda! That is so true. Time spent with family, esp. parents is a blessing. Thanks for reading and commenting!